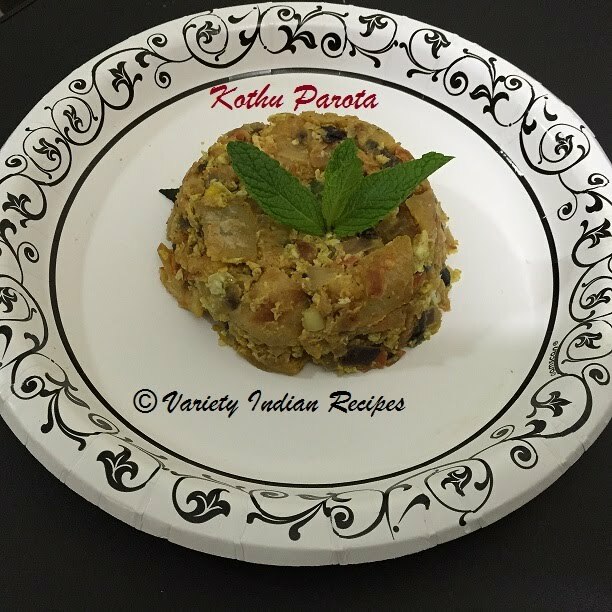 Egg kothu parota is a popular street food in Tamil Nadu. Here minced/ shredded parota is tossed with egg and spices to give a delicious recipe. It is a perfect recipe for dinner. It can be eaten as a snack too. Now add onions, green chillies and fry till the onions become translucent. Add ginger garlic paste and saute well until the raw smell goes off. Add the tomatoes and saute well until the tomatoes are soft. Add turmeric powder, chilli powder, garam masala, pepper powder, salt and saute for a minute. Break the eggs and add it to the pan and mix well. When the egg is half cooked add the chopped parota and mix well. Adjust salt accordingly and saute well. Saute until the eggs are completely cooked and blended with the parota. Turn off heat and serve hot with onion raita.